Properly traditional English cider made for the ready. 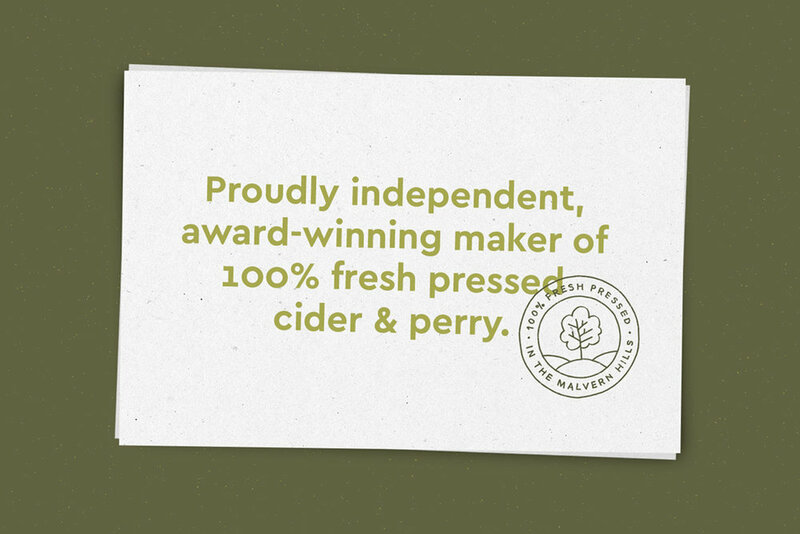 Based in the rolling countryside close the Malvern Hills, Allen Hogan and his modest cider business know a thing or two about proper English cider. His been crafting his authentic process based on traditional methods and quality ingredients for a couple of decades and grown the business to a point where recognition and reputation for great tasting cider. But the Hogan's sought to do more in an industry notoriously difficult to eBut the Hogan's sought to do more in an industry notoriously difficult to enter and dominated by a few large players, most of whose products are lacking much provenance and quality and instead tend to be produced with imported fruit and added flavourings and sugar. To this end, cider also has something of a reputation issue which they wanted to start challenging in much the same way craft beer has been very successful. Claire Hartley and I paired up to beat a couple of design agencies in winning the work to assess and rebrand the business relative to where the business wanted to go in the coming years. With a bunch of exciting new product innovations in the pipeline and ever growing reputation for great quality cider in a market that is ripe for growth, we spent the best part of 12 months devising a new strategy and visual direction for the overall brand and 15 products (new and old).